Industry Experts, Inc. introduced the global market report on Endoscopy Devices. The new report entitled “Endoscopy Devices – A Global Market Overview” reveals that Asia-Pacific is expected the fastest growing market for Endoscopy Devices, projected to register a CAGR of 8.2% during the period 2017-2024 to reach US$13 billion by 2024 while North America is the largest market. An endoscope is a lighted medical device that finds application in performing diagnostic and therapeutic interventions within the hollow cavities and visceral organs of the body such as the brain, esophagus, lungs, abdomen and gastrointestinal (GI) tract, among others. Endoscopy focuses on examining abdominal pain, ulcers, digestive tract bleeding, and abnormal growths in the colon and other abdominal & gastrointestinal conditions. This procedure’s minimal invasiveness and fewer complications after operation render it to be the procedure of choice in diagnostics and surgery. The primary factors propelling growth for Endoscopy Devices market include an increasing geriatric population, obesity, changes in demography and lifestyles, which have resulted in growing incidences of cancer, gastrointestinal diseases and other chronic conditions on a global basis. Demand for these devices has also gained traction due to technological developments in visualization, diagnosis and surgical endoscopic treatment, as well as growing awareness among patients and the medical fraternity in regard to the benefits offered by endoscopy. 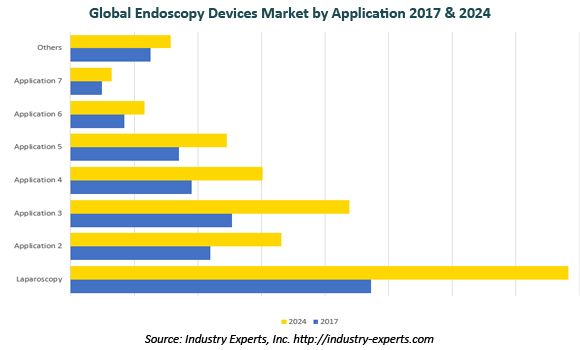 Laparoscopy is estimated the largest application market for Endoscopy Devices with an estimated share of 30% that is equivalent to US$9.5 billion in 2017, followed by Gastrointestinal Endoscopy and Urology Endoscopy with 16.2% and 14% respectively in the same year. Gastrointestinal Endoscopy is also expected the fastest growing application of endoscopy devices with a CAGR of about 8% during the period 2017-2024. The report reviews, analyses and projects the Endoscopy Devices market for global and the regional markets including North America, Europe, Asia-Pacific, South America and Rest of World for the period 2014-2024 in terms of value demand in USD. The regional markets further analyzed for 14 independent countries across North America – The United States, Canada and Mexico; Europe – France, Germany, Italy, Spain and The United Kingdom; Asia-Pacific – China, India, Japan and South Korea; and South America – Argentina and Brazil. The report analyzes the Endoscopy Devices market in the above regions by major country, product segment and end-use applications. This 370 page global endoscopy devices market report includes 226 charts (includes a data table and graphical representation for each table), supported with meaningful and easy to understand graphical presentation, of market numbers. The report profiles 16 major players across North America – 12; Europe – 4; and Asia-Pacific – 2. The study also provides the listing of the companies engaged in manufacturing and supply of Endoscopy Devices. The global list of companies covers the address, contact numbers and the website addresses of 369 companies.